In early September I traveled to the hills above Rising Sun, Indiana (http://www.EnjoyRisingSun.com), and the Ohio River to join long-time friend Debbie (Smith) Blum and spend the weekend with another friend, Debbie (Salyer) Tuggle and her husband Dean at their B&B, Tuggles’ Folly (http://www.TugglesFolly.com). To view a slideshow of Tuggles’ Folly, click on any of the photos. 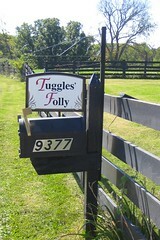 An inviting sign welcomes visitors to Tuggles’ Folly B&B. 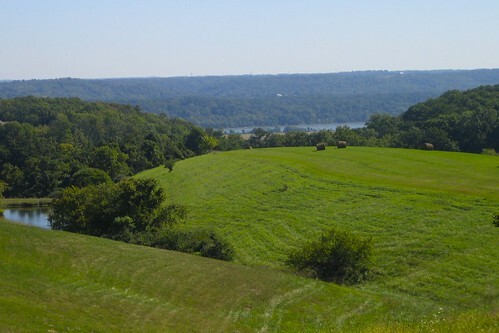 Tuggles’ Folly overlooks rolling hills and the scenic Ohio River east of Rising Sun, Indiana. 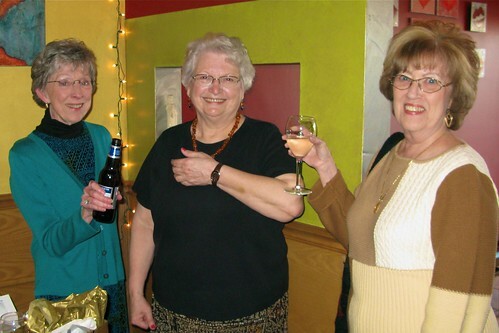 Except for brief visits through the years, we gals had not spent much time together for over 25 years when we’d been teachers/librarian at Lawrenceburg High School. 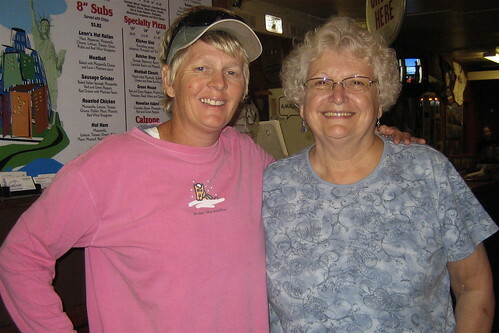 These two ladies, along with our dearly departed friend Eileen Donewald, gathered weekly after the football or basketball games (sometimes with a few other stragglers) to solve the problems of the world…over and over again…with the proper accompaniments. Friends. Delicious food. Breathtaking scenery. Fun. What better combination can one ask for in a weekend getaway? After a scrumptious breakfast on Saturday and while the Tuggles took care of business on Saturday, Debbie Blum and I drove first to Lawrenceburg and then down scenic Hwy. 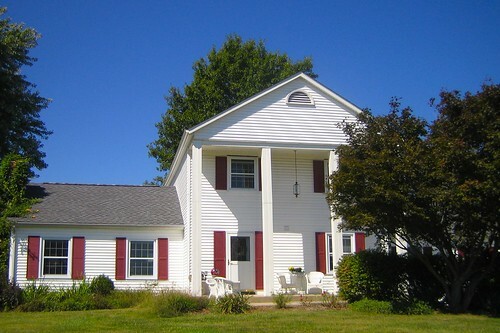 56 to Vevay, Indiana, where we drove up and down the streets, checking out the lovely homes. We knocked on the door of the Schenck Mansion (http://www.schenckmansion.com), also a B&B, and were given a tour of the downstairs by the gracious owner. After the tour Debbie and I sat in their new patio area chatting and basking in the perfect autumn afternoon. We’d read that the Rising Sun EMT squad was having a chicken BBQ event on Saturday. Attending the event sounded like a good idea. And it was a good idea. What we didn’t know was that the event was held midday when we’d expected it (assuming doesn’t work, does it?) to be held in the evening. We had stopped at the Ridge Winery and Tasting Room east of Vevay on Hwy. 56 (http://www.TheRidgeWinery.com) where Debbie purchased a bottle of excellent white wine for us. We drank one glass on their patio overlooking the Ohio River and took the remainder home with us. Little did we know that it would be our dinner accompaniment. We drove by the Rising Sun fire station where we thought the BBQ was to be held. No one was there. We drove on the riverfront, but a fishing tournament was being held there. No one we asked knew anything about a BBQ so off to the local grocery we trekked to purchase some dinner: crackers, cheeses, and some fried chicken. With the wine and our purchased dinner, Debbie and I placed our fare on the back patio table, propped our feet in the additional chairs, and devoured our meal as we sipped the wine. Sunday morning’s breakfast was another delight: biscuits with sausage gravy, bacon, scrambled eggs, and a treat: fried peaches, a new treat for me. There might have been even more items on the table for no empty spots were available on the table as the hosts, Debbie Blum and I, and two other guests paced ourselves to fully enjoy this feast. I have a new traveling buddy, a stuffed wolf whom I’ve named WOLFINA (aka Wolfie). She spent many years on one of nightstands of my friend Leandra who lost her five-year battle with cancer in late May. Now Wolfina belongs to me. View a slideshow of Wolfie by clicking on her photo. To return to the blog, use your Back arrow. 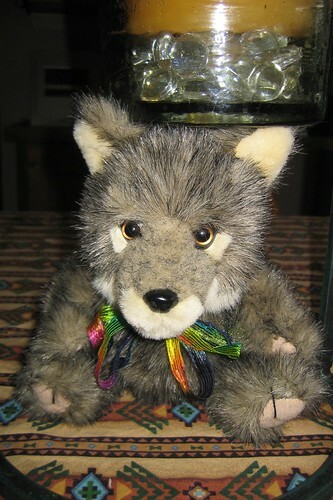 Wolfie wears the rainbow ribbon that Sheila gifted her. Wolfie is filled with Leandra’s mischievous spirit and even with her laugh, which only I can hear. Well, maybe some of you will be able to hear the laugh too, if you listen very carefully. Wolfie and I have bonded already; she’s with me on the road, and we plan many adventures. 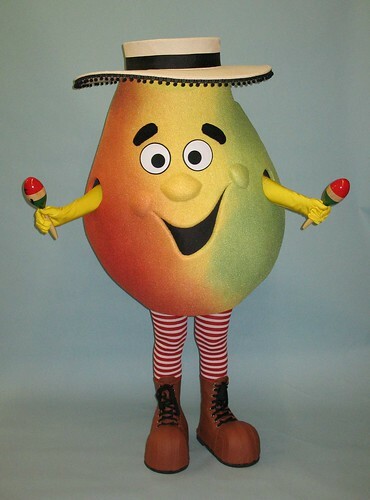 Here’s the tale of why I needed a new traveling companion. Many of you may remember that Mississipi Moose (MM), who actually belonged to Jennifer was my traveling companion for many years. Because I traveled alone frequently, Jen loaned MM to me so I wouldn’t be lonely. MM was photographed at different places where I, alone or with friends, went sightseeing: on the Desert Loop roadside at Carlsbad Caverns National Park in New Mexico, on a the ski resort lift near Taos and a bridge railing over the Rio Grande Gorge, both also in New Mexico. Sadly Mississipi Moose was stolen from a side pocket of a piece of my luggage when I went on a cruise celebrating Sheila’s 50th birthday. Jen’s friend Andrea, who lives in Switzerland, sent a moose replacement, but Andrea was firm in her instructions about his care: he could not travel with Joy! I have a little bear which Sheila, Shelley, and Barbara bought for me on that infamous cruise as an MM replacement, but somehow the bear and I have never bonded even after traveling together for almost five years. I do like him, but…he hasn’t even been named. I now have a Mississippi Moose replacement: Wolfina. Follow us as we travel coast-to-coast! 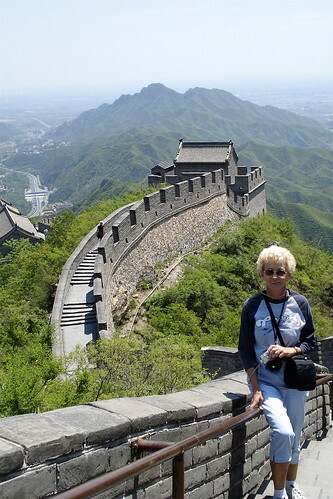 My long-time friend and house/pet-sitting pal Doris joined three friends from California and toured China in May, 2008. The group who were accustomed to earthquakes were still a bit surprised when they felt the tremor although they were not in an affected area. 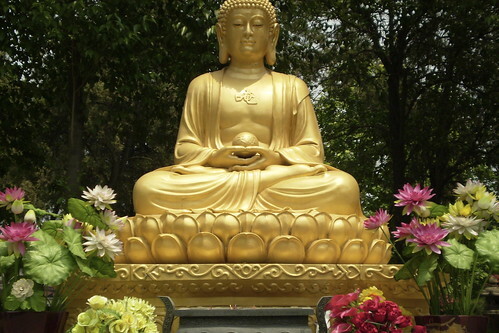 Click on any photo in this post to see a slideshow of the China photos taken by Doris and Patti. Use your browser’s back arrow to return to the blog. Doris walks on the Great Wall of China. 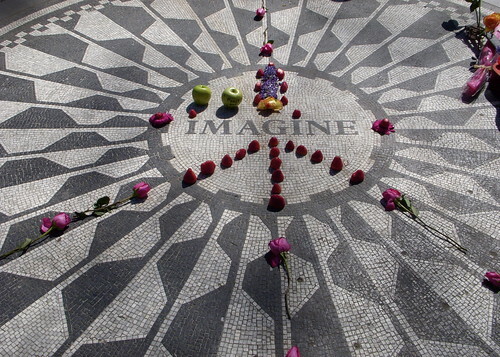 A trip to New York City, in mid-March! Columbia Scholastic Press Association holds its annual spring convention at Columbia University at that time each year, and my friend/yearbook adviser Sheila attended, allowing me and friends Gerri and Barbara from Oklahoma City to tag along for the six days. Click on the final photo in this post to see a slideshow of our sightseeing and adventures in The City. Use your browser’s back arrow to return to the blog. For more comments/photos about NYC, see the June 30, 2008, posting: New York, never the same after the ‘sisters’ hit town. 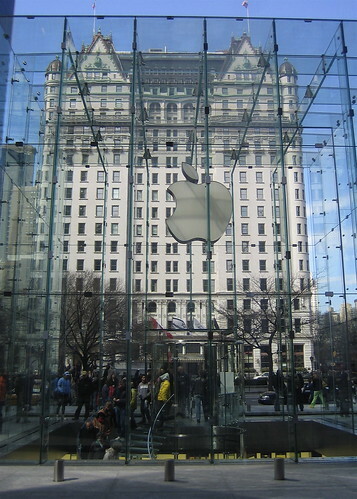 The newly-renovated historic Plaza Hotel stands across 5th Avenue at Central Park from the Apple Store’s plexiglass cube entrance. 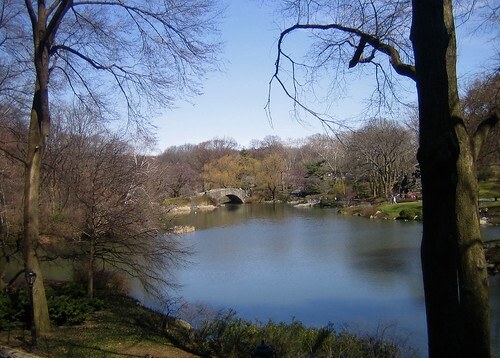 One of the lakes in Central Park. 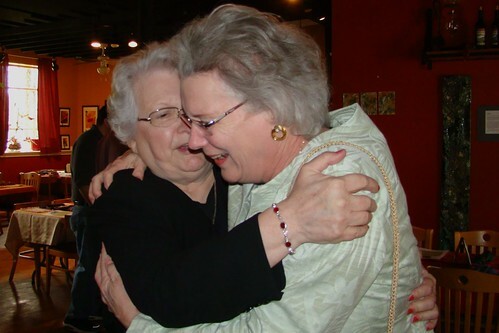 On December 29 my friend Doris and I began our road trip to Texas, arriving at the home of friends late on December 30. With a night’s rest we were ready to start activities for New Year’s Eve: visiting Rebecca’s new yoga studio, allowing the children in ourselves out to enjoy the swings hanging from a huge Live Oak tree on the property where Rebecca’s studio is located, and buying last-minute food and drink items. 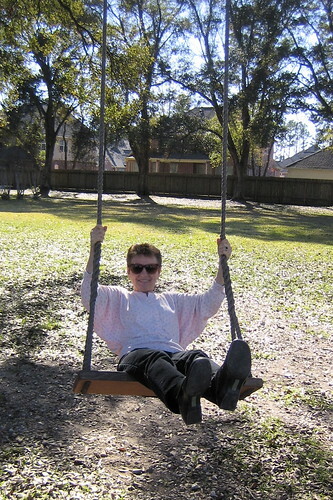 Jody takes advantage of the sunny New Year’s Eve afternoon in Houston to swing under the Live Oak tree. One carload (those buying the food and drink items) found a bin of MicWright cocktail napkins at one of the establishments and stood there reading them all and giggling, often so hard as to bring stares from other customers. 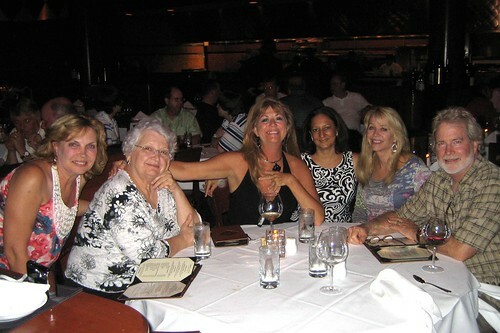 The other carload of the group, shopping was on their agenda. The after-Christmas sales were, of course, the attraction. By early evening everyone finally arrived for the party. 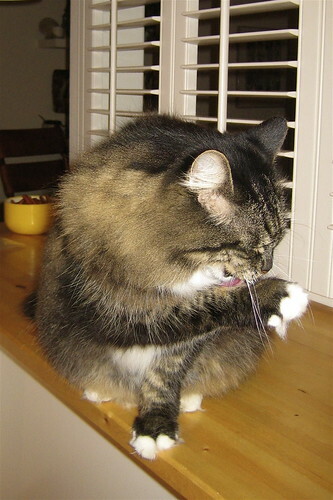 However, Shelley had to have a haircut before the party could begin and professional stylist, Russ, accommodated her. 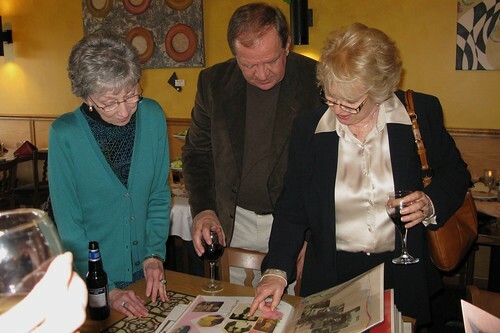 Scrumptious food and beverages covered all the kitchen counters and dining room table. Playing Outburst kept part of the crowd occupied. Shelley, Carrie, and Jody’s team won by making cutthroat decisions which gave no leniency to the opposition team of Doris, Rebecca, and Joy Dean. Although Bill initially helped both teams, he ultimately decided that the latter team was being treated poorly and helped only them). Finally midnight arrived, toasts were made, and then the dancing began. One song in particular was played over and over. Around 2 a.m. everyone had left or wandered off to their beds. For a slideshow of the swinging, the haircut, and the cats and dog who entertained us throughout the day and night, click on the photo below. 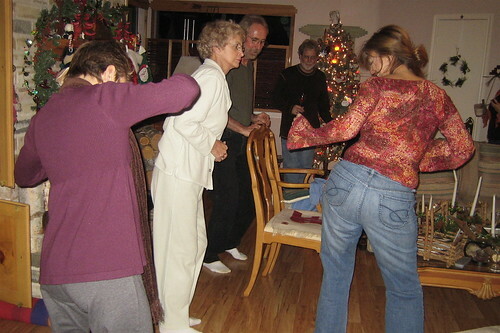 Jody, Doris, Sheila, Russ, and Bill boogie the night away!